Aunt “Sissy” Rattigan saved the Treasury Department envelope, “Important: Contains U.S. Savings Bonds” recycled to store important photographs and newspaper clippings. My husband identified this 1912 candid as his grandfather, James Aloysius Corrigan. After graduating high school, Jim worked as a clerk in a Hazleton (PA) clothing store, and held offices in the Clerk’s Union and St. Gabriel’s chapter of the Knights of Columbus. In his late twenties, Jim attended Bloomsbury State Normal School before following his brothers’ footsteps to Jefferson Medical College, Philadelphia, Pennsylvania, in 1911. The thirty-one year old medical student posed for someone’s camera the following summer, nattily dressed in a wool suit, hat in hand. I wonder what stories floated through that open window. On this anniversary of Robert Minor’s death, I am seeking cousin-ly review. Robert is shown here in front of his home on Ceylon Lane. With confidence I can identify his wife, May, and his two children, Helen and Donald. But who are the rest of the folks? What say you, descendants of John P. and Isabella Minor? 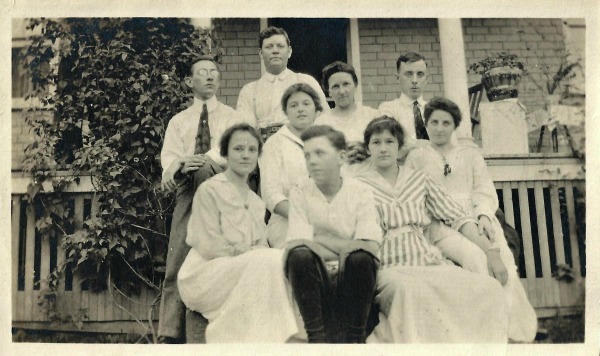 Minor Family Group Shot circa 1915. Back row (l-r): unknown, Robert Minor, May Minor, unknown. Middle: unknown. Front row: Helen Minor, Donald Minor, unknown, unknown. My camera is three and a half pounds of image-capturing magic. Mary Jane Minor’s mouth would round in wonder at its 1295 frames. My great-great-grandma and I are alike in this regard–we collect faces, without identifying the occasion or relation or special qualities that make those eyes so admired, so treasured. Nonetheless, the portraits, now and then, are at an edge, where private lives meet public spaces, revealing a good bit about who we are, what technologies shape our present, what kinds of people add value to our days. I can confidently put names to only a few faces. So what? This Victorian album is evidence of the sweeping movements of people and machines that transformed my ancestors’ communities in the closing decades of the nineteenth century. More than faces, these portraits are portals to history. Sometime between 1883-1888, F. P. Morgan ushered these three people into his Uniontown (Pennsylvania) studio on Morgantown Street, and shot this cabinet card photo. Their identity is concealed by the passage of time; their relationship to the Minor family of Green County lost in a historical fog. Their relationship to each other, however, is clearly described in the photographer’s clever posing. 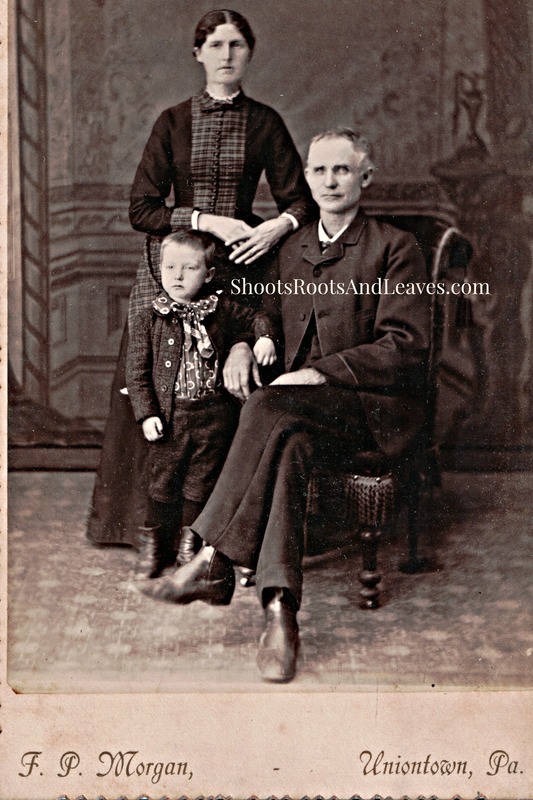 The silver-haired gentleman sits relaxed in an upholstered chair, while the woman and boy stand to his right with their arms resting on his shoulder and arm. Their hands line up, smack dab in the middle of the frame, a visual statement–We are family. The tableau is vintage Victorian; the husband is seated in the only chair signifying his role as patriarch and the woman is beside him as helpmeet. Together they shelter and nurture their six(ish) year old son. Three faces, one family. Incognito. Unidentified Family, cabinet card, F. P. Morgan, photographer, Uniontown, Pennsylvania, 1883-1888. The Minor Family Album, p. 18, Author’s Collection, 2014.